If playing the fire out of a guitar for over 50 years isn't enough for you, add recording artist, hit songwriter, award winning producer, arranger, engineer, actor, label head, and you start to get the picture of the many talents of Steve Cropper. A founding member of The Mar-keys, and Booker T. and the MG's, his guitar playing is legendary world wide. Inducted into the Rock and Roll Hall of Fame in 1992, the Rhythm and Blues Pioneer Award in 1995, the Songwriters Hall of Fame in 2005, and the brand new Musicians Hall of Fame in Nashville, in 2006. 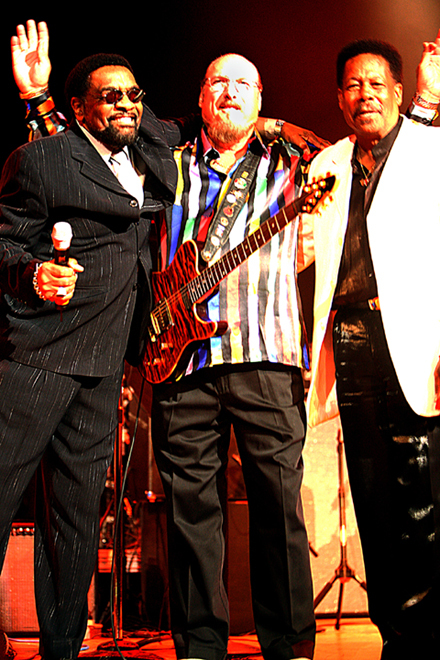 Steve "The Colonel" Cropper has already left his distinctive mark on the history of American music and he is far from done, having just won a Lifetime Achievement Award at the 2007 Grammy's as a member of Booker T. and The MG's. Play It Steve! Records, 1998, Play It Steve! Sam & Dave - Otis Redding - Eddie Floyd - Jerry Lee Lewis - Aretha Franklin - Elton John Rod Stewart - Etta James - John Lennon - Ringo Starr - Paul Simon - Peter Frampton - Buddy Guy - Johnny Lang - Steppenwolf - Art Garfunkel - Albert King - Pop Staples - Neil Sedaka - Leon Russell - Chris Hillman - Richie Furay - Wendy Waldman - Bob Dylan - Richie Havens - Roy Buchanan - Levon Helm - Duane Eddy - Buddy Miles - Boz Scaggs - Aaron Neville - Wynonna Judd - Jimmy Buffett - Rufus Thomas and Wayne Newton. As an actor, he has appeared in both hit movies made by The Blues Brothers. The first in 1980 titled The Blues Brothers with John Belushi and Dan Aykroyd, and the second in 1998 with Dan Aykroyd, John Goodman, and Jim Belushi, titled Blues Brothers 2000. In 1996, MOJO Magazine compiled a list of the top 100 Greatest Guitarists of All Time and Steve Cropper was ranked #2, behind Jimi Hendrix. A muliti-instrumentalist, he also plays bass guitar, piano, and organ. A successful studio owner on Music Row in Nashville, Steve Cropper continues to make lots of music. He heads his own label, Play It Steve! Records, and his guitar playing is still in great demand here in the US and abroad. He also designed a guitar for Peavey, called the Steve Cropper Classic. Delbert McClinton - James Burton - John Kay - Lee Roy Parnell - Randy Owen - B.J. Thomas - Michael McDonald - Felix Cavaliere - John Anderson - T. Graham Brown - Mark Farner - Danny Shirlely - Beth Nielsen Chapman - Rob Paparozza - Ray Vega - Robben Ford and Peter Gallagher. The house band at this very special show consisted of David Michael Santos, Jim Horn, Mark Beckett, Bob Britt, Mark Jordan, Roy Agee, Steve Herrman, Sam Levine along with several great back-up singers. All there to help celebrate 50 years of Soul with the soul man himself, Steve Cropper.